Crash Sensor Brick is a sensor module based on crash switch, simple circuit design, high sensitivity. Octopus Electronic Bricks, you can use them to build electronics projects just as easy as piling bricks. By using Octopus electronic bricks, you may connect Arduino/Freaduino compatible boards easily with various digital, analog and I2C/Uart interfaces. These the breadboard-less firm connection are prepared to extensive modules like poteniometers, sensors, relays, servos even buttons, just plug and play. Connect octopus crash sensor brick to P1 port on OCTOPUS:BIT. Or you can download the program from the page below. 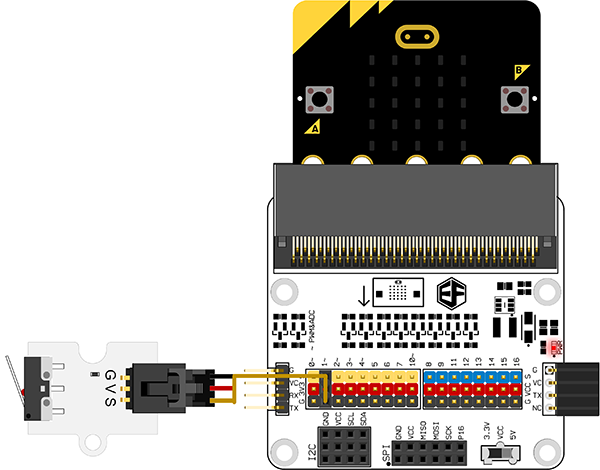 When the metal shrapnel on the crash sensor is pressed, micro:bit displays a rectangle; when it is not pressed, then micro:bit displays a heart.